Follow Vegan Cuts and get notified when they add new offers. We're combining our two greatest loves, travel and discovering new vegan products, into a special-edition care package series. 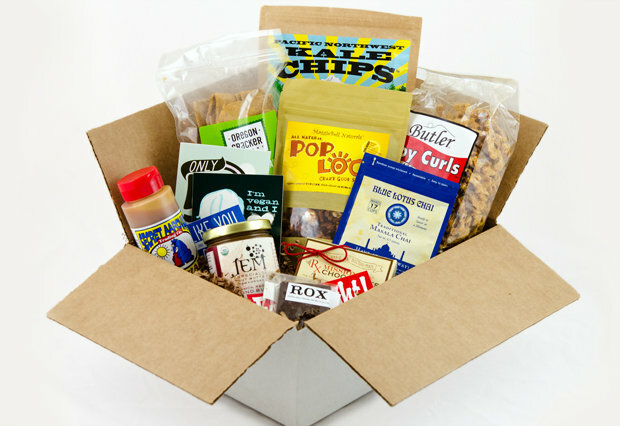 Our first travel-themed care package features our favorite products from Oregon, home to Portland, the vegan mecca. Now you can experience a selection of Oregon's top vegan eats without hopping on a plane. Missionary Chocolates Salted Vanilla Caramel Truffles - Velvety soft, chewy caramels with undertones of vanilla, a coating of rich, dark chocolate, and a light sprinkling of Madagascar vanilla bean sea salt. 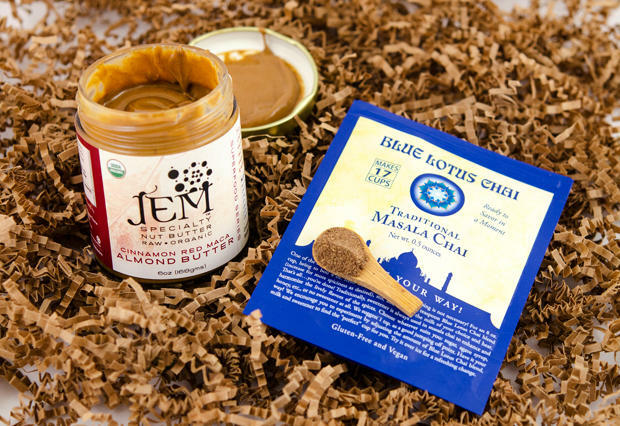 Jem Raw Chocolate Cinnamon Red Maca Nut Butter - Jem Raw Chocolate handcrafts this warming, powerfully nutritious raw almond blend in mountainous Bend, Oregon. Maggie Bell Naturals PopLOCO - Made with a wholesome medley of popcorn, nuts, puffed brown rice, and seeds to help power you through the day! Pacific Northwest Cheezy Kale Chips - The magical combination of cashews, bell peppers, spices, and nutritional yeast result in a super cheezy, super addictive, super healthy snack. 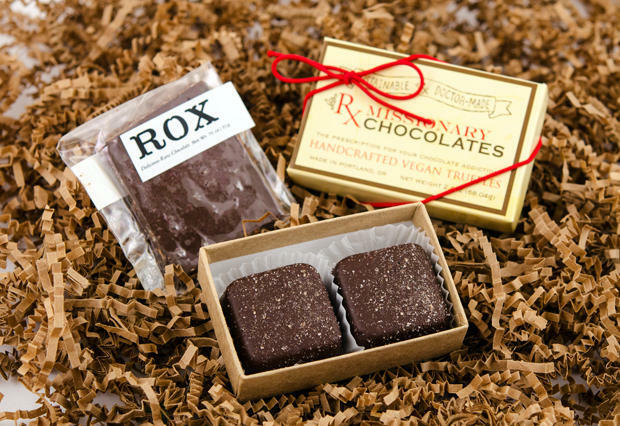 Rox Chox Raw Chocolate - Free of most allergens and sweetened only with birch, these tasty squares of chocolate are rich, nutritious, and downright delectable. Secret Aardvark Habanero Hot Sauce - A clever Caribbean & Tex-Mex fusion sauce made with flavorful, spicy Habanero peppers and smoky roasted tomatoes. 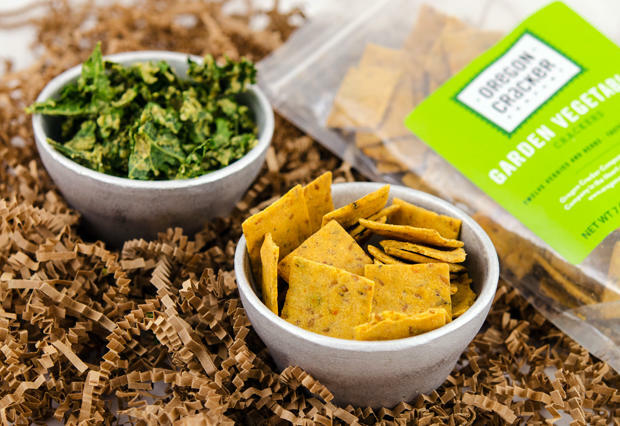 Oregon Cracker Company in Garden Vegetable - Savor these crunchy, party-worthy crackers simply because they contain a whopping combo of 12 different veggies and herbs! 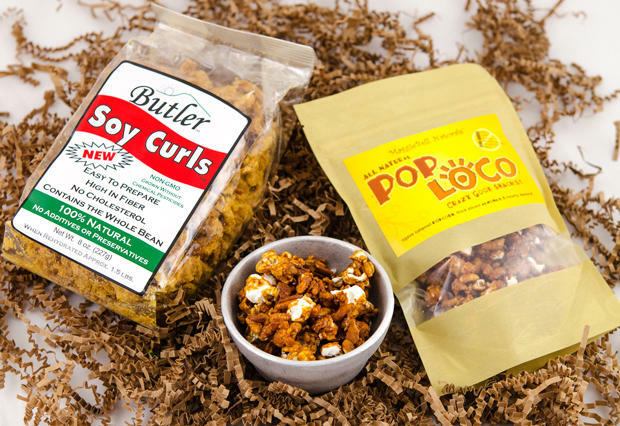 Butler Foods Soy Curls - These perfectly textured, heart-healthy, non-GMO morsels soak up the flavors in your favorite dishes and feed your belly with plant-based goodness. Blue Lotus Masala Chai Tea - If you are craving a truly authentic mug of chai, this is the tea for you. Simply mix 1/4 teaspoon of the flash-dried chai powder with hot water and your vegan milk of choice. Voila! 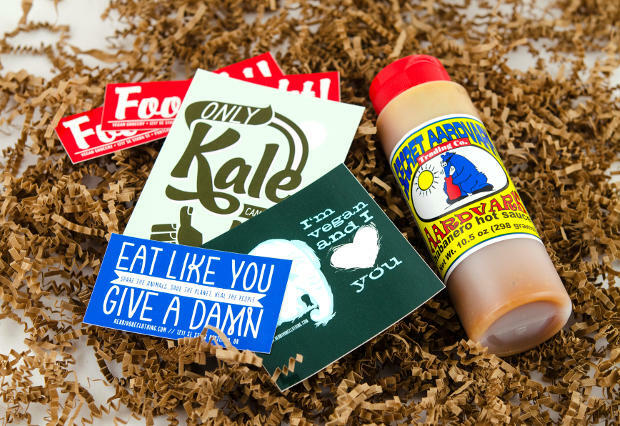 Herbivore Clothing Company Stickers - The Herbivore Clothing Company designs and sells vegan message apparel in Portland. Put these vinyl stickers on your bike, car, laptop, or water bottle and start spreading compassion. Food Fight! Grocery Sticker - Show some love for the world's first all-vegan grocery store by smacking this sticker wherever you please. Shipping information is collected during checkout—triple check your shipping address please! Your order will ship directly from Vegan Cuts within 3-7 business days. All products are vegan and made without wheat or gluten. However, they may have been manufactured in facilities that also process wheat, milk, and other allergens. Ingredients: Organic kale, organic cashews, organic yellow bell pepper, organic onion, organic lemon juice, organic turmeric, nutritional yeast, salt. Ingredients: Fair trade chocolate (cacao beans, sugar, cocoa butter, soy lecithin, pure vanilla), organic coconut milk, organic brown sugar, organic vanilla, vanilla sea salt. Ingredients: Organic fair trade cacao, xylitol (extracted from Indiana birch trees), organic fair trade coconut oil, organic fair trade coconut flakes, organic fair trade vanilla extract (non-alcoholic), Celtic sea salt. Ingredients: Organic white popcorn, almonds, organic puffed brown rice, organic pumpkin seeds, organic sesame seeds, organic sunflower seeds, organic blue agave nectar, organic canola oil, olive oil, sea salt. Ingredients: White wine vinegar, roasted tomatoes, habanero peppers, onion, carrot, sugar (made from beets), prepared mustard, water, kosher salt, cornstarch, herbs, spices. Ingredients: Stone-ground sprouted almonds, coconut palm sugar, red maca, cinnamon, vanilla. Ingredients: Multigrain flour mix (millet, sorghum, flax, brown rice, amaranth, sweet rice), water, organic non-GMO canola oil, tapioca starch, potato starch, vegetable and herb mix (tomato, onion, carrot, celery, red and green bell peppers, garlic, paprika, oregano, basil, chives, spinach), sea salt, baking soda, vitamin E for freshness. Ingredients: Naturally brewed and flash-dried black tea powder, 100% certified organic powdered spices: ginger, cardamom, nutmeg, black pepper, cinnamon, cloves.